Anglican priest Father Michael Lapsley is the director of the Institute for the Healing of Memories in Cape Town, South Africa. Born in New Zealand, he moved to South Africa in 1973 and served as the National Chaplain of Anglican Students while attending Durban University. As the result of his political and social organizing he was expelled from the country by the apartheid government. For the next quarter-century, Father Michael lived in exile in Lesotho, the United Kingdom, and Zimbabwe. He became a member of the African National Congress of South Africa (ANC), which was waging an underground guerrilla struggle against apartheid, and served as a chaplain for the ANC for many years. From 1987-1990 he worked as a theological consultant and coordinated an ecumenical program of popular education about apartheid under the auspices of the Lutheran World Federation. In Harare, Zimbabwe in April 1990 Father Michael was sent a letter bomb by the South African government. Narrowly avoiding death, he lost both of his hands, an eye, and his eardrums. After months of recovery in hospitals in Zimbabwe and Australia, he undertook an international speaking tour starting in December, 1990 reflecting on his own bombing and survival and the current situation in southern Africa. After repatriating to South Africa in 1992, he became one of the first two employees of the Trauma Centre for Victims of Violence and Torture in Cape Town. He testified before Desmond Tutu’s Truth and Reconciliation Commission and in 1998 he helped launch the Institute for Healing of Memories. Father Michael’s work assists faith communities in the process of healing the psychological, emotional and spiritual wounds of violence. His ministry in South Africa addresses the ongoing trauma from the apartheid period, and he also travels the world to work with communities seeking to emerge from violence and injustice to nonviolence and just relationships. Since working with September 11th Families for Peaceful Tomorrows members Colleen Kelly at a 9/11 speaking event in New York City and Andrew Rice at the April 14 – 18, 2004 “Journey Towards Healing and Wholeness Conference,” held on Robben Island, the site of Nelson Mandela’s 25-year imprisonment before his release and election to the post of African National Congress President, Father Michael has played an important role in our own healing process. 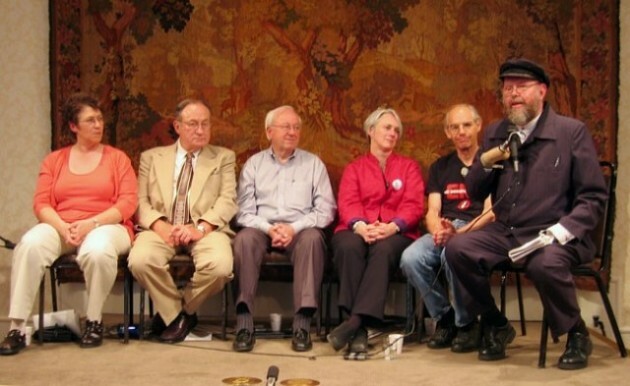 He joined Rice and other Peaceful Tomorrows members in Oklahoma City in April, 2005 for events around the 10th commemoration of the bombing of the Murrah Federal Building, including a traveling exhibition of The Forgiveness Project which features Father Michael as well as Rice. He later joined us at the Garrison Institute for our international conference, “Civilian Casualties, Civilian Solutions” where he shared his wisdom and helped us to launch the International Network for Peace, of which he is a member. Father Michael can be reached by email at info@healingofmemories.co.za.